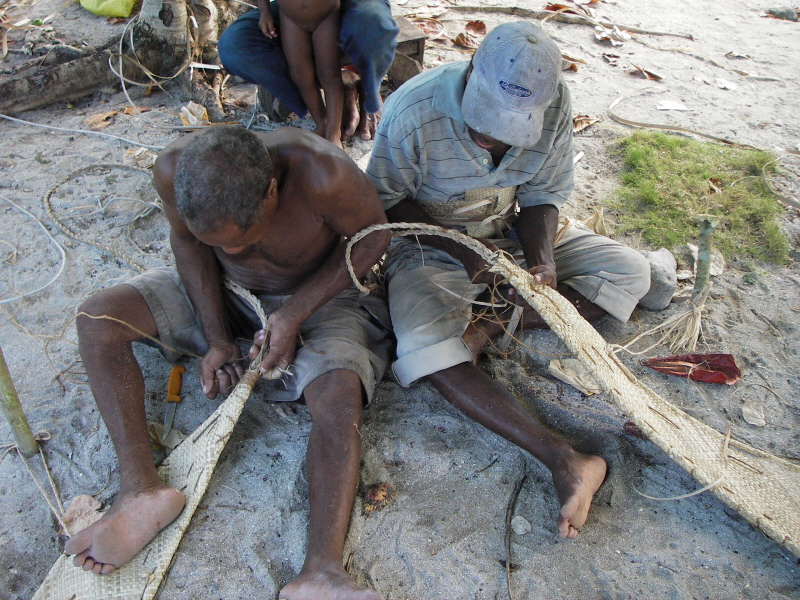 Before modern sailcloth was available, women and girls used to weave sails from strong leaves like pandanus. (In some places, like Satawal, they still know how to do this.) They collected leaves that were long and flexible GLOSSARY flexible - easy to bend but not too young. 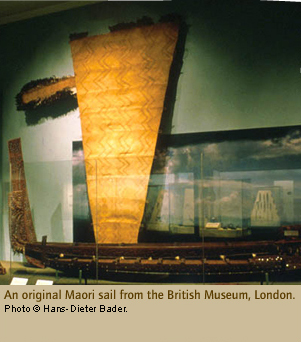 They stored them in the women's house until they had enough to make a sail. 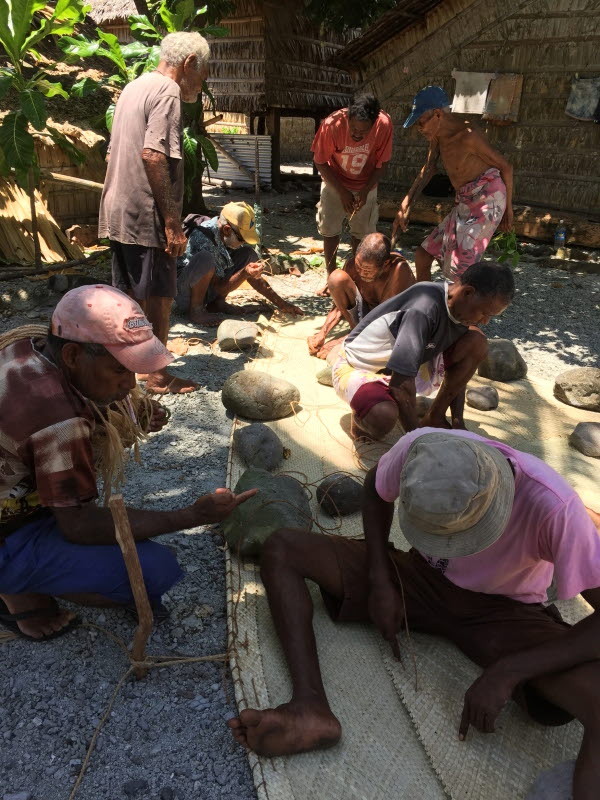 The women sat on the floor to weave the leaves - like weaving a mat. Then the sail was cut to the right size and shape. The edge of the sail was made especially strong to resist the pull of a big wind. Small girls learned first by watching and then by practising. Weaving was one of the many things that they learned at the women's house. 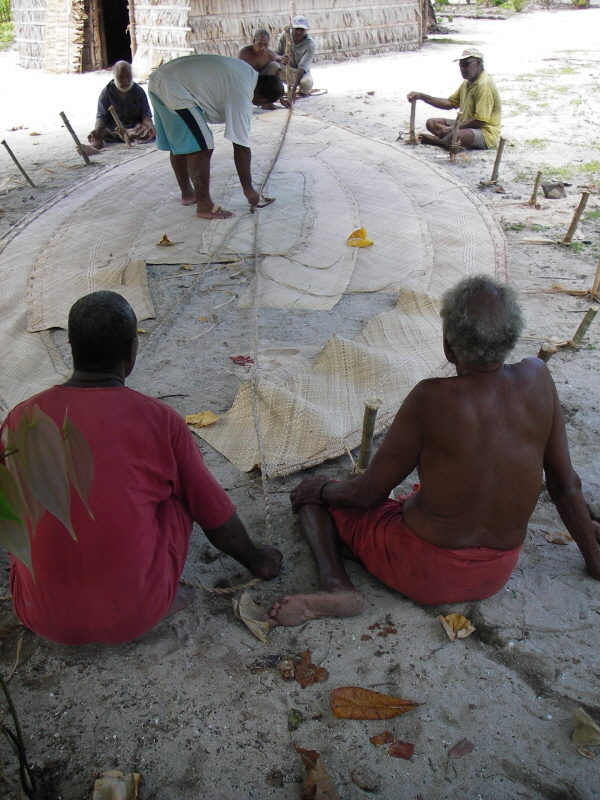 Taumako voyagers still use pandanus sails all the time for sailing their vaka. 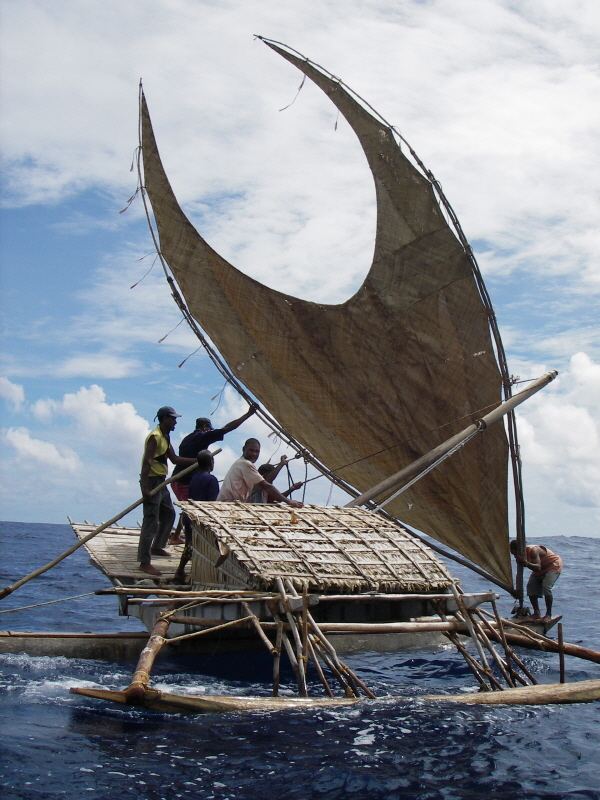 To make a sail, first the women and girls harvest laupaku leaves. While they are still green, they soften them by laying them out in the sun for an hour or two, or quickly passing them over a fire. They use a strand of coconut fiber and pull it down each edge to slice off the thorns. Then they slice the leaves into long strips. They make these strips about 1cm wide, just like they make for weaving sleeping mats. Then they weave the strips together into sail mat panels. 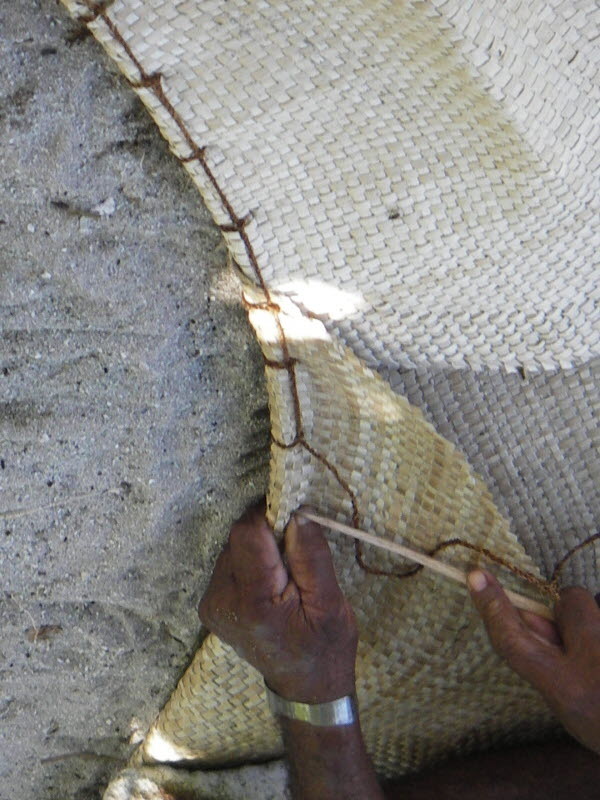 Sometimes they double weave (weaving two layers) the edges of the mat – like a thicker ‘belt’. Sometimes they weave a thicker ‘belt’ down the middle of the mat. 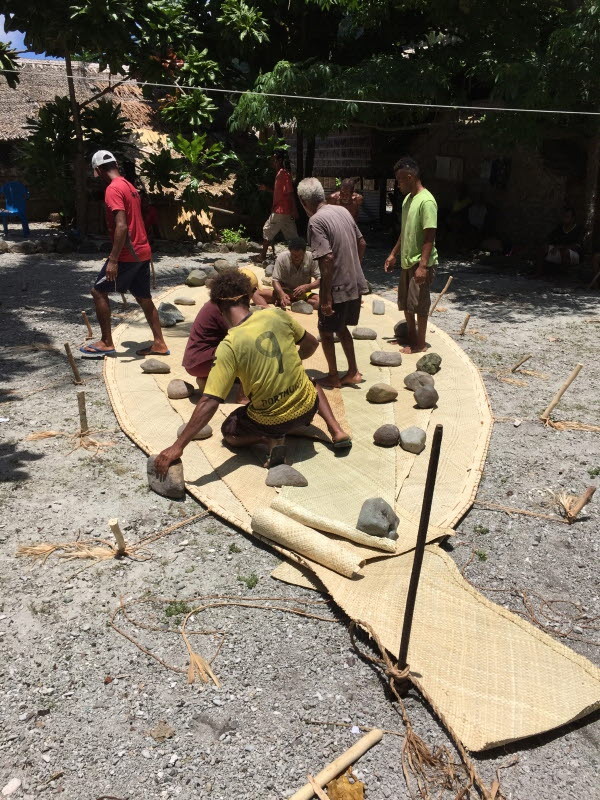 The men and boys lay out in the sail panels so each is in the exact position with the right size and shape They pull and cut the mats until the bottom edges of each pair meet each other at the mid-line of the sail and their top edges form the top part of the long ‘arms’ of the sail. The bottom ends of the next longest panels meet each other above where the longest panels meet each other. The top end of the second longest panel forms the ‘shoulder’ of the sail. The bottom ends of the third pair of panels meet each other on top of the second panels. The top ends of the third panels and the top ends of the two shortest panels fill the top of the inside of the sail—which forms most of the middle of the ‘quarter moon’ curve of the sail. After they sew the panels together they measure the position of the inside curve and lay out a line in the shape of a crescent moon. This line becomes the bolt rope of the inner edge of the sail. Their heroic ancestor Lata was the first person to make a sail, so this long-armed crescent shape is the image of “Lata holding his arms over his head.” Perhaps Lata is grasping the wind! 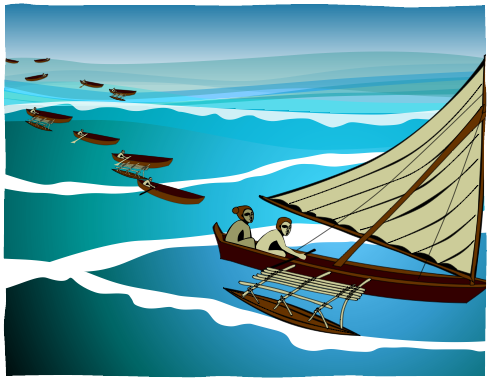 Ten brothers were to have a waa race to decide who would become chief of the island of Jeh. Each boy carved a strong paddle. The bigger boys showed off their skills and made fun of the younger ones. The smallest boy, Jabro, was quiet. When the race began, their mother, Liktanur, asked each son to take her and her heavy load on his waa. They all said no except Jabro, even though he knew it would slow him down. For his kindness, his mother showed him how to use the sail, which she was carrying in her load. 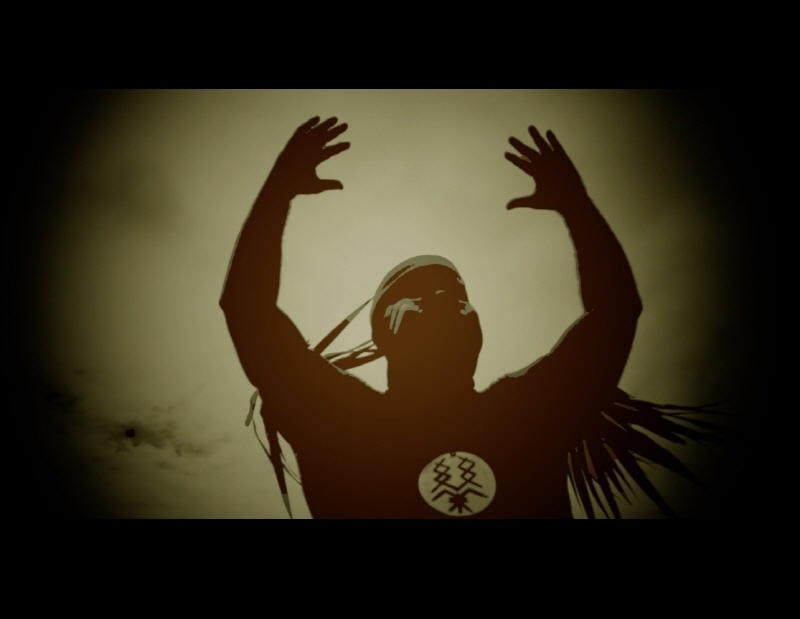 Jabro beat all his brothers in the race and was called Jabro-Jeleilon, Iroij, the Wind Catcher. As the sons of Liktanur finished their lives on earth, their mother took them up to the night sky. Liktanur is now one of the brightest stars above the Marshall Islands. Each son can be seen in his correct position to guide ocean voyagers. The only star close to Liktanur is Jabro.